1st CHOICE provides personalized referrals for senior housing, senior care, and in-home care services by matching your specific needs with the most suitable resources in your area. Adult Placement Network strives to help seniors remain at home as long as possible. They connect seniors to home health care, occupational therapists, medication management systems and Adult Day Care so seniors can stay in the home they love for longer. The mission of the Avamere Family of Companies is to enhance the life of every person we serve. Through that philosophy, we have developed a continuum of post-acute care and adult living settings that provides seniors with a variety of compassionate and thoughtful health care choices. Columbia Medical Alarm offers local personal service for the Philips Lifeline medical alert service. Philips Lifeline, the #1 medical alert service, is easy-to-use and designed to reduce the risk of living alone. In the event of a fall or an emergency, help is available at the push of a button. Edgewood Point Assisted Living in Beaverton, Oregon, combines the care seniors need, the convenience they value, and the independence they cherish. Frontier manages quality senior housing and services throughout the United States. We have expertise in Retirement and Assisted Living, as well as Memory Care. Their beautiful and inviting communities provide the comfort and service that their residents expect. The Golden Girls will Guide you through the Senior Housing Options with Integrity and Compassion. Living Right Senior Placement offers FREE assistance to find the most appropriate living community for seniors. Miramont Pointe is a senior living community that promises independence, peace of mind and a lifetime of enjoyment. All in a serene setting of incredible beauty, both inside and out. Miramont Pointe is the pinnacle of senior living in the Pacific Northwest. Nestled next to a natural preserve at the base of Mount Talbert in Clackamas, Oregon, you’ll find stunning views, compassionate people, convenient luxury living and a lifestyle of wonderful enrichment. Portland Sign Company designs and creates vinyl signs, banners, vehicle graphics, sandwich boards, car magnets and custom name badges . At Rose Schnitzer Manor, family is at the heart of everything we do. Like a family, they provide personalized care and support in a safe, warm and nurturing environment. Their residents enjoy nutritious, home-cooked meals, daily fitness classes, plus a wealth of activities to stimulate the mind, body and soul. 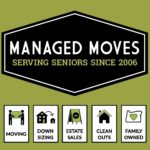 Need help downsizing and relocating? Stressed? Overwhelmed? Not sure where to start? One call will offer solutions for all your needs. Soft Landings offers solutions for organizing, packing, moving, settling in, dispersing family treasures and much more. You make the key decisions, we guide and assist you with gentle expertise. There's no job too big or too small. We are prepared to handle it all! You can trust us with your most prized possessions. We will make sure they get to their destination in the same condition they left in. Go ahead, give us your mess, and we'll be the ones scrubbing the floors, not you! Terwilliger Plaza is a non-profit, Continuing Care Retirement Community for 62+ in the heart of Portland, Oregon. Strong, independent and self-governed, it’s a city under one roof and a doorway to one of the most dynamic cities in the world. The Ackerly at Timberland is retirement community in the heart of Portland’s Cedar Mill neighborhood. We will be opening summer 2016 and are now taking reservations. The Heights at Columbia Knoll offers a wide range of retirement services such as full service dining, activities, recreational programs, housekeeping, maintenance, transportation and more. West Hills, the premier senior living center in southwest Portland. Hidden away from the bustle of the city and surrounded by lush trees, gardens and flowers, you’ll find a haven here for living the good life. A beautiful environment, compassionate staff, wonderful friends and a graceful lifestyle all combine to make our complex the perfect place for aging in place.